All seven #NECFB teams are in action this week. The slate features two matchups against National top-10 programs as well as a pair of road games at CAA venues. Sacred Heart will revive a series with Ivy League member Dartmouth; the two met three times from 2010-12 with the Pioneers winning twice. 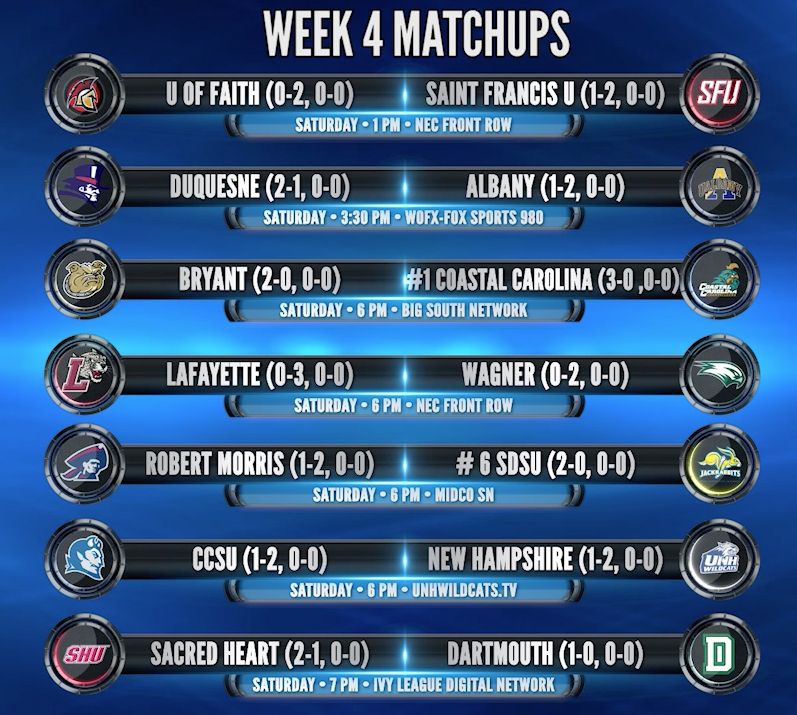 Wagner will host Patriot League member Lafayette on Homecoming, while Saint Francis will play an exhibition against U of Faith on Family Weekend in Loretto. Check out the Week 3 schedule and video preview below. On this #FootballFriday, we remember a man who was arguably the greatest pass-catching tight end in Northeast Conference history. Robert Morris alumnus Shadrae King enjoyed a fulfilling career in Moon Township. Playing under the tutelage of former NFL tight end Joe Walton, King flourished to the tune of three consecutive all-NEC selections. 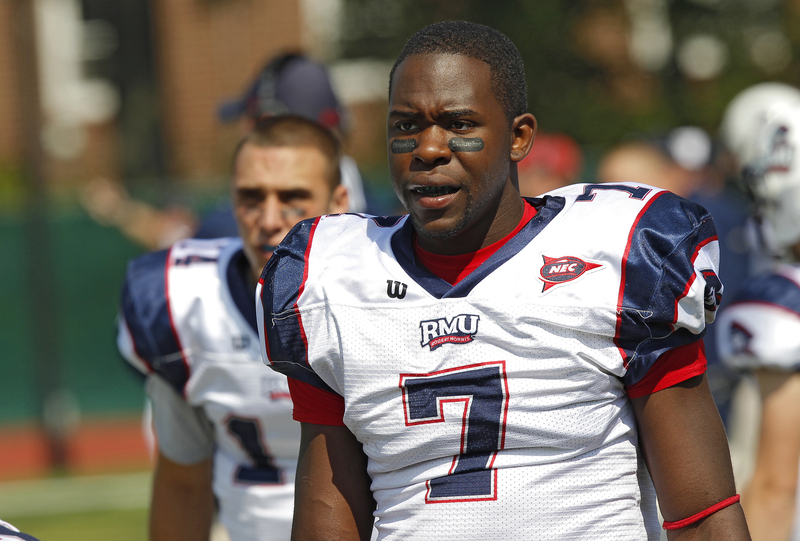 King graduated as, and still remains, Robert Morris’ all-time program leader in career receptions (145). He ended his career by making at least one catch in 30 straight games, another RMU program record. His finest season came in 2010 when he helped Robert Morris to its first-ever FCS playoff appearance and earned All-America honors from three organizations, including the Associated Press and STATS Inc (formerly The Sports Network), for his efforts. He totaled 43 receptions for 531 yards in 2010, both league-leading marks for a tight end. His seven receiving touchdowns were second-most on the overall leader board. In a 2010 NCAA FCS playoff game at North Dakota State, King made five catches for 68 yards. And, don’t let all of his receiving accolades fool you. He could block well, too. King was part of a unit that helped spring Myles Russ loose for 4,271 rushing yards (sixth most in NEC career history). The NEC administrative office handed out weekly awards in the following sports – women’s volleyball, men’s soccer, women’s soccer, football and cross country. Below are the top performers from the past week in Northeast Conference fall sports. Seven non-conference matchups are sprinkled throughout the Week 3 schedule. 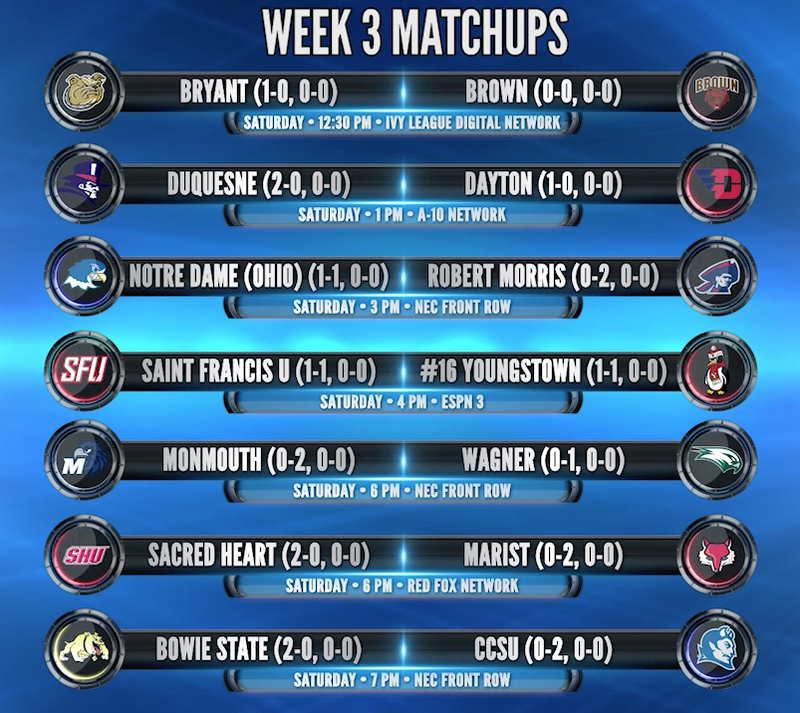 Bryant, Duquesne, Sacred Heart and Saint Francis will contest road games. Robert Morris will celebrate Homecoming at Joe Walton Stadium. Wagner welcome Outer Bridge rival Monmouth to Hameline Field. Central Connecticut wraps up the Saturday slate under the lights at Arute Field.